The DARWIN's value is tied to an underlying trading strategy. A DARWIN is like a wrapper around a trading strategy. When the trading strategy goes, for example, long EURUSD, investors who have bought that DARWIN will replicate this and will also go long EURUSD. However, they will never know the details of this underlying trade in real time. Instead, they will track the DARWINs listed price and will be able to see their P&L in real time. As an example, if someone had bought a DARWIN at 117 and the underlying strategy made a winning trade, the value of the DARWIN would increase to above 117. When an investor buys a DARWIN, the DARWIN starts to replicate for him or her the trades of the underlying strategy. The investor does not know the live trades of the strategy. Why? Because live trades are considered to be personal knowledge belonging to the trader. Through DARWINs, investors can follow a trading strategy while, at the same time, respect the trader's work. 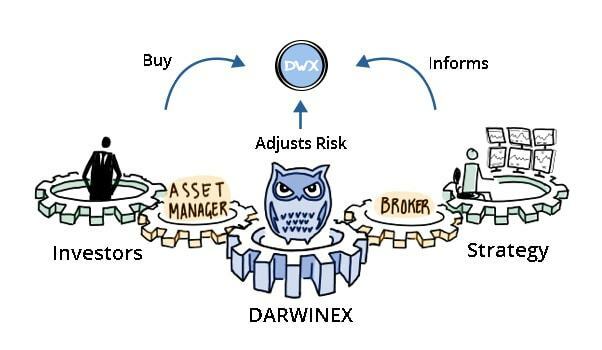 Further, investments in DARWINs are managed by Darwinex, a broker and asset manager regulated by the FCA and not by the traders themselves who, this way, get rid of the bureaucratic burden of becoming regulated asset managers and can focus on what they do best: trading. How does the replication process work? On the one hand we have the strategy which informs the DARWIN. Whenever a strategy places a trade, the DARWIN places the trade for investors after having passed through the risk manager. 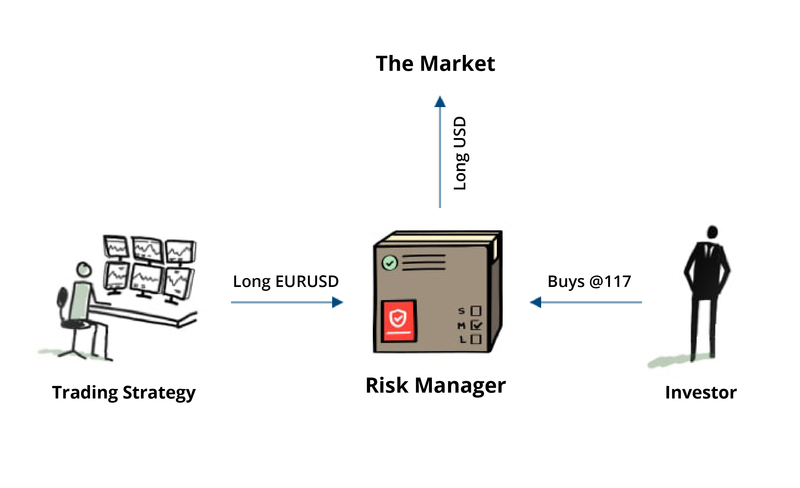 The aim of the risk manager is to protect investors from the trader taking excessive leverage. Another aim of the risk manager is to achieve the same risk for all DARWINs so that DARWINs become easily comparable and investors can know the risk of their investment. In order to achieve its aims, the risk manager makes two types of adjustments. The first type of adjustment of an adjustment to the VaR factor and the second type of adjustment closes the trade partially in case the strategy takes risk outside its historical parameters. Adjustments take place by trade open and also throughout the lifetime of the trade. This transformed strategy is what investors buy. How risky is a DARWIN? We've mentioned that all DARWINs have the same maximum risk target, managed by Darwinex, not the trader. But how much is that risk? By default, each investment in a DARWIN has a 10% monthly value at risk with 95% confidence. An investment having a monthly Value at Risk of 10% with 95% confidence will lose 10% or more in a month, 5% of the time (which is why we say worst month is 20). The flip side of this is that this same investment will make more than -10% 95% of the time, that is, 19 out of 20 months. When you invest in several DARWINs at the same time, the risk of your portfolio will be lower than 10% monthly value at risk due to the fact that diversification lowers the risk of your portfolio. There are two types of costs when investing in a DARWIN. On the one hand, investors pay execution commissions to the broker for getting their trades on the market. This cost is already factored into the P&L of their investment. On the other hand, investors pay 20% of their quarterly profit per DARWIN to the DARWIN provider (the trader). We call this fee performance fee and it gets retained when you sell a DARWIN or when your investment in a DARWIN reaches quarter end. If you have no profits with a DARWIN in a quarter, you don't pay any performance fees. How to buy your first DARWIN? You can buy your first DARWIN by clicking the "Trade" button next to the DARWIN you want to invest in. You'll see this button in different parts of the investment platform, like the DARWIN's page, the filters or the DarwinIA trading contest. If you want to buy a specific DARWIN, just type its handle into the search box and it will pop-up immediately. Minimum investment per DARWIN is 200 units of your base currency.